Come stay in our 2,200 sq. ft. spacious, light and airy 2BR+ large loft/3BA beautiful condominium located DIRECTLY ON THE LAKES of lower Deer Valley. This ground floor end unit boasts 21 windows each with a spectacular mountain or lake view. It is not your typical “tunnel shaped” condo. There is a large open living/dining room with expansive new picture windows facing the Deer Valley Ski Resort. There are two large private bedrooms plus an OPEN loft area with lots of room for everyone! Snuggle by the fire next to the floor to ceiling gas fireplace in the spacious living room or just take in the amazing lake and mountain views. Enjoy a fully stocked kitchen and a large dining area seating 8. There are two private bedrooms both with comfy king size beds plus a large oversized loft with two single beds and a comfortable full size futon. Enjoy a large outdoor ground level patio with private hot tub and picnic table or just relax on your romantic upstairs balcony overlooking the lake. In the WINTER, enjoy the GREATEST SNOW ON EARTH! Located just ½ mi. from the famous Deer Valley Ski Resort...Voted by SKI Magazine the USA’s #1 Ski Resort in 2002, 2006, 2009, 2010 and again in 2016! Just hop on the free city bus with stop located right in front of your condo and be at the Snow Park Lodge in 4 minutes. Relax on the signature wide, smooth, groomed trails or try the more challenging black diamonds at Empire Canyon. Enjoy the outstanding variety of two other ski resorts including awesome snowboarding at Park City Mountain Resort (2.5 mi.) or the Canyons Resort (5mi.). After a great day of skiing you need only go 1 mi. into downtown Park City to enjoy fine dining, shopping and entertainment on Main Street. If gourmet is your style, head up to Silver Lake Village for dining in one of the many award winning five star restaurants. For those of you who choose to drive on your vacation, park in our covered garage in your assigned space along with plenty of guest parking too. In the SUMMER, step out onto the backyard patio for a fun barbeque picnic surrounded by over 6 acres of ponds, fountains, flowers and manicured lawn or just enjoy feeding the ducks in the lake. You may even spot elk or moose! For the more adventurous try some of the many hiking trails or go mountain biking. Not far away you can practice your fly fishing on the Weber or Provo River. Finally, you absolutely cannot miss the wonderful outdoor summer concerts at Deer Valley Snow Park amphitheater featuring world class entertainment. Bring a picnic and blanket and sit under the stars for a thrilling treat of song and symphony! This property is not suitable for children under age 7. We are a family of four from sunny South Florida. We love Florida but we also love to ski. We visited Park City, UT for the Sundance Film Festival in 2005 and fell in love with the quaint town and great powder snow. 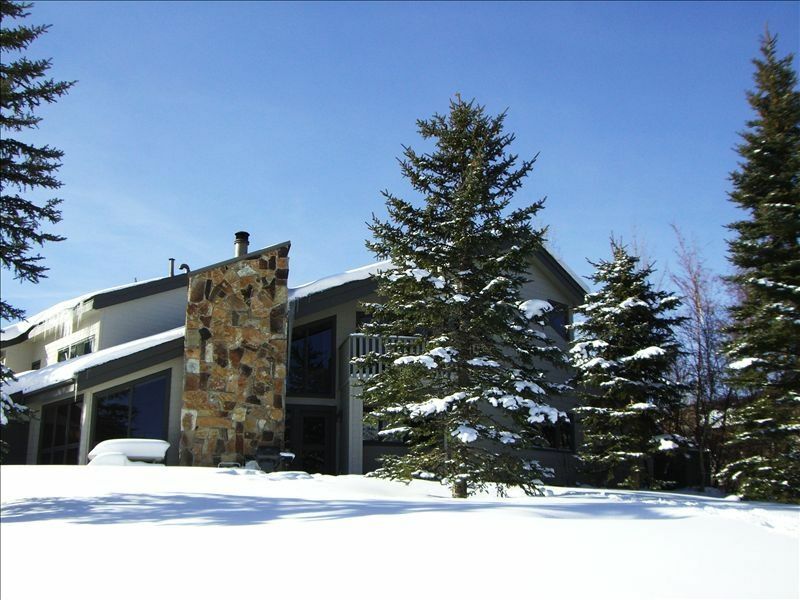 We chose the Fawngrove because of it's great location right on the lake in lower Deer Valley and it's open expansive views of Deer Valley Ski Resort. Our condo is a very spacious end unit (2,200 sq. ft.) and the complex is on over 9 acres of land...something you can't find anymore in Deer Valley! Less than 1 mile from Main Street Park City, UT. Deer Valley Ski Resort 1/4 mile from your door! Just 50 steps to the water. WALKING PATH directly behind condo. Lake just beyond light posts. Do not walk on frozen lake or surrounding ponds during winter. Amazing mountain views looking directly at Deer Valley Ski Resort runs plus many other spectacular mountain peaks! Large living room with 18 ft. stone fireplace and expansive mountain views! No need to scrape ice or snow from your windshield in the winter! Covered heated parking! Floor to ceiling 16 ft. gorgeous rock fireplace. Remote control Black Box with OFF/ON switch. Easy instant roaring fire! No mess...no fuss! (3) Three Flatscreen TV's..... WiFi for YOUR laptop computer! FISH in the ponds of Deer Valley right in your own backyard! Feed the ducks or watch the moose! Great location convenient to both Deer Valley and Park City and on bus route. Garage was great. Nice hot tub. Very open and bright with wide open view of snow covered lake and hills of Deer Valley. Kitchen very well equipped. Only negative I would say is no washer/dryer in the unit itself although available in the garage as a community laundry room but not very nice. Would definitely consider staying here again. We thoroughly enjoyed our stay here. Very well appointed. There was nothing we needed that they didn’t have. The hot tub was so very nice. Suzie was super easy to connect with and very detailed. We highly recommend this condo to any family going to deer valley! We are so pleased you enjoyed your stay and our new awesome 7 seat hot tub!!! Condo was very spacious and comfy for a family of 6. The best views we have ever had . . . The hot tub was perfect for all 6 of us, very private and a great view of the mountain. Very close to the bus stop or 15 minute walk to lift. Very well stocked with everything you need for cooking to family games to tissues & toilet paper. We are so glad you enjoyed the BEST VIEWS in Deer Valley and our new large hot tub! It was a pleasure having you as our guests! Location plus Perfection equals Beautiful stay! Suzie and Daniel have a beautiful condo very close to the ski resort Deer Valley. We walked to the ski resort most days and took the bus other days that goes past the condo every 20 minutes. The condo itself exceeded our exceptions! It was spotless and the view was spectacular! Suzie and Daniel sent us and left papers at the condo that answered all the little questions we had such as wi-fi and code to the garage door. We had a wonderful stay and plan to go back next year! We are extremely pleased that you enjoyed the amazing views and convenient location! Fantastic location for the slopes! Our family of 4 had a wonderful ski vacation at Deer Valley! The condo is extremely well appointed and has a great view of the mountain and ski slopes. Suzie was easy to work with and provided ample information of the area and activities. We will for sure consider it again for future trips! We are so glad you enjoyed the fantastic location and amazing views of Deer Valley Ski Resort! Visit the famous Utah Olympic Park home of the 2002 Winter Olympic Games or attend the popular SUNDANCE FILM FESTIVAL. Choose from three world class ski resorts...Deer Valley, Park City Mountain or the Canyons!